Sometimes publisher blurbs do good books a real disservice. 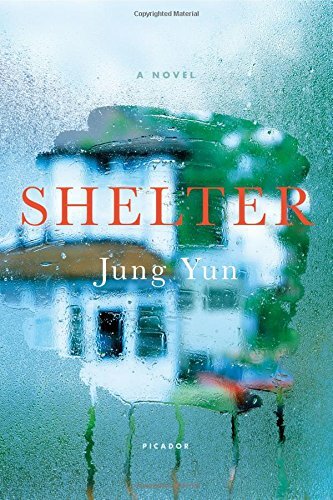 I was only lukewarm-excited to read Shelter, because from what I understood, it was about a modern family in the midst of a debt crisis brought on by living above their means. And that's just not the kind of book I'll line up to read, you know? I don't have much patience for people who get themselves into financial pickles by spending money they don't have. Guess what? That's not what the book is about, at least not centrally. Yes, there is a cash-strapped family, but the real crisis is about so much more than foreclosure and high interest rates. As beleaguered husband and wife Kyung and Gillian show a realtor around their home and pray they can get more for it than they still owe, they look out and see a naked woman running through the field behind their house. How's that for an attention-grabbing opening scene? And when Kyung recognizes the woman as his mother, I was hooked. So forget the debt angle. This is a literary thriller of the highest order. Kyung is struggling to make sense of not only what happened that day, but his entire lifetime preceding it. He has some major emotional baggage to unpack, and the upbringing he had with his traditional Korean parents didn't equip him for anything but avoidance and silent fuming. While Shelter doesn't quite match the pitch-perfect tone of Celeste Ng's Everything I Never Told You, it strikes a similar chord with its deep exploration of a flawed family and what made it that way. With regards to Picador and Goodreads for the advance copy, which I was gobsmacked (but happy!) to win in a recent giveaway. On sale March 15. TagsA Touch of Melancholy, Brutally Detailed, Dysfunctional Families, I Love My Family But..., Incompatible Couples, Keeping Secrets, Mamas and Papas, You Think Your Childhood Was Screwed Up?